Every once in a while a company hits the direct sales scene with a product that no one else has ever had and just creates their own path to greatness. That was exactly what I thought back in 2011 when Damsel in Defense exploded onto the market. A direct sales company with personal protection equipment and accessories?!! No way! What an innovative – and fabulous – idea! As a woman who travels alone a LOT – I was a Damsel in Defense fan from day one. Damsel in Defense is a social selling company that specializes in keeping you safe! With the statistics of crime against women growing, owners Mindy Lin and Bethany Hughes knew they had to do something. In less than a year they had formed this great company and brought on over 1,000 Damsel Pros to help teach and equip women with the knowledge and tools that they need to feel secure. Independent Damsel Pro Robin Richter sent one of my favorite products from the Damsel in Defense line – Road Trip. I have had one of these for several years in my car, and with my 18-year-old daughter now driving I was excited for her to have her own. The Road Trip is a multi-use tool that can help in just about any auto emergency. The Road Trip fits perfectly in the console or glovebox of your car for easy access. It is lightweight but has tons of cool features. The Road Trip has a punch glass breaker for an emergency escape, a sharp blade to cut through a locked seatbelt, a 3-function LED flashlight, LED emergency beacon, 110-decibel alarm, and more. It also has built-in side magnets so you can attach to the top of the side or top of a vehicle – which is great in the dark or in bad weather to signal for help. It runs on simple AAA batteries and comes with a lifetime warranty. Hosting a Damsel in Defense Empower Hour is both fun and rewarding. You and your guests can learn tips for how to stay safe and keep those you love safe as well, all while earning free products. 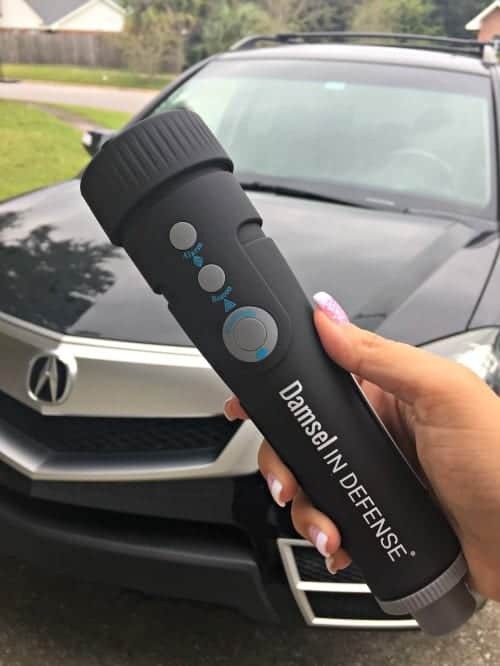 If you have a passion for safety, you can join the Damsel in Defense family and help bring down the crime statistics one woman at a time.